It's back to some zombie action once again. This time around I'm continuing in a series written by David Moody, one of the best zombie horror writers, I've read. The funny thing is, the zombie word has yet to appear in this series and this is the second book. Sure there are reanimated corpses, cadavers, bodies walking around, but no one ever brings up the "Z" word. There is once that one of the characters compares the walking corpses to those in the movies their kid used to watch. But Moody is able to bring you the horror of zombies without the word or even flesh eating monsters. Sure the gore is still there with rotting flesh and dead people walking around and looking decayed, but they don't attack, at least not at first, and then when they do, it's more a matter of the numbers of dead bodies, than the fear of being eaten or worse turned into one of the living dead. This makes the horror a deeper more emotional horror and plays on a different side of fear. Being part two of what is a four part (so far) series, I'll give you a little bit of a background, but one thing I noticed was that this book could easily be read independent of the first book, which was titled, "Autumn." Both books basically run parallel to each other until later in the book when a couple of characters from the first book show up and blend in with this story. In "Autumn" the same as this book it all starts out with a day like any other, people on their way to work when all of a sudden many are struck with a sudden illness that within seconds leaves them dead, choking on their own blood. In the first book a few survivors meet up in a community center all dumbfounded that suddenly everyone they know is now dead. In fact all the deaths happen so suddenly that the roads are jammed with wrecked vehicles, and bodies. Not knowing what to do the few group in the center just simply trying to make sense of it all. After a couple of days the dead bodies begin to get up and walk around. Not threatened by the slow ambling bodies, the survivors ignore the bodies walking around not able to cope with this new horror. The bodies simply walk until something is in the way and then change directions. After another couple of days the bodies begin to respond to noises made by the survivors. Still not threatening but nonetheless horrifying, Three of the survivors including Michael and Emma decide to head out of the small town and out into the country where there will be less bodies walking around and try to make a new start of it. 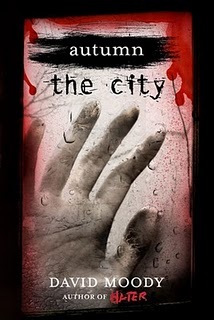 Now for this book, "Autumn" The City." The beginning parallels the events in the first book but this time around the survivors are in a major city. With the higher population of the city the sheer numbers of walking cadavers soon overpowers the survivors who are holed up in a local university. The thing that makes this book a little more different and interesting is that Moody introduces the military into the mix. At the beginning of the book a strange alert goes out and all local military are shuffled off to a hidden underground base. The military is forgotten until after the point when the walking corpses start to get a little more aggressive. At this point the hidden away soldiers decide that after a few weeks and no communications with the outside world a scout party needs to be sent out. Lots of zombie horror, but not the typical flesh eating terror, rather the survival and psychological horror of the end of the world. Now on to book 3 "Purification." Help me raise money for Riley's Children's Hospital.